Search for office space from the Waterfront to Muizenberg and settle on a great and gorgeously located building in Constantia close to some superb vineyards, the names of which are a challenge (for some) to pronounce. Uitsig anyone? Tear down dividing walls and create some open plan space. Throw in a re-designed kitchen and bar stools. Recruit a posse of ninja coders. Add a spoonful of va va voom. Place some very temporary tables, chairs, sofa and coffee table in to the mix to get up and running. Go shopping for generous portions of kit not forgetting a tablespoon of VOIP telephony. Rejoice in the arrival of a container from the old country containing IKEA desks and bookcases, a meeting room table and chairs so comfortable it’s hard saying goodbye. And lastly but definitely most importantly, a coffee machine that rocks. Film the above for another blog post arriving shortly. Blend in the sites and sounds of a hip and happening city and for icing on top, throw in a World Cup for good measure. Go Engerland. 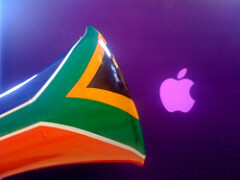 Go Bafana Bafana.